Every state has their own laws for how a landlord can evict a tenant. As per the laws in California, a landlord is required to send a “3 Day Notice” to the tenant before taking any legal action or proceeding with the eviction. However, there are times when it is the tenant who has good reason to fight against the eviction. 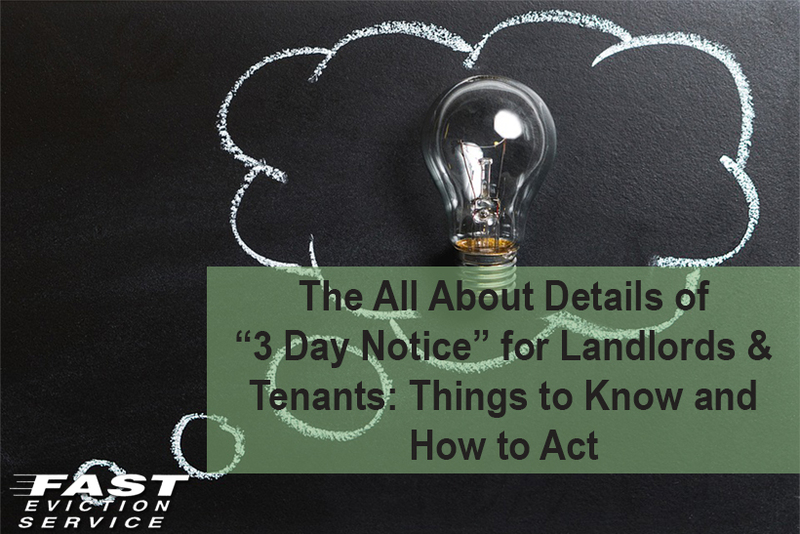 This article will talk about what a 3-day notice is, when this notice can be used, how a tenant can respond to it, and more. When can a landlord use this notice? No matter what the reason is, when a tenant receives this notice, they either have to take responsibility for the action or vacate the property. If the tenant does not vacate the property even after this notice has expired, the landlord can then take the matter to court. If the tenant has a reason to fight against the charges in the notice, they can do the same in court. How to respond to a 3 Day notice? For instance, if the notice is due to non-payment of rent, if the tenant is not able to pay the rent, they can try to negotiate for a partial payment during this 3 Day period. However, remember that the landlord is under no obligation to accept partial payment of rent and can continue the eviction process or take the matter to court. An important thing to remember here is that this notice is not an eviction notice. Even after receiving the notice, tenants can try to resolve the problem with the landlord to prevent the eviction. If this notice is ignored, the landlord can then start the eviction process in court. If the notice is received by the tenant due to reasons, like nuisance, damage to the property or illegal activity at the property, the tenant should quickly respond to it. Once such a notice is received, the tenant should vacate the property as soon as possible or the problem can worsen if the matter reaches court. The 3 Day Notice time period is calculated as starting the day it is served and expires at the midnight of the third day from the next day when it was issued. However, if the third day is not a business day being a weekend or holiday, it will expire at the midnight of the next business day. Remember that the day on which the notice is issued will not be counted. So for instance, a 3 Day Notice issued on Monday will expire at midnight on Thursday. And if Thursday is a holiday, it will expire at midnight on Friday. Weekends do not count. Under the law of California, a landlord has three options when it comes to issuing a 3 Day Notice. The landlord or his/her agent can personally hand over the notice to the tenant at rental property. The landlord can also mail the copy of this notice through certified mail, registered mail or regular mail. If the notice is mailed, the landlord should also request a return receipt. If at all, the landlord fails to give the notice to the tenant personally, they can leave it at a conspicuous location at the property, like taping it to the front door. It is very important for the landlord to make sure that the notice is properly received by the tenant. If it doesn’t, the landlord would be required to again send the notice. Until the notice is properly received by the tenant, the counting of three days will not begin. If you are either a landlord or a tenant, use the above-mentioned information in the best possible manner to try and avoid getting involved in a legal battle. Landlords and tenants should try to resolve the matter themselves with involving the court as once the case is in court, it can consume a lot of time, money and energy by everyone involved.